Success in politics is not gifted to decent people. Their are traits in the character of successful politicians and Murray has them in abundance. He is an excellent constituency MP and spokesman on national affairs for his party. In the 2015 GE the SNP underestimated his abilities and paid the price. He studiously observes the “5P’s” (Proper, Planning, Prevents, Poor, Performance) in his approach to everything he does which may impact on his professional career. He works long hours in his constituency and at Westminster. His pen is his weapon of choice and he weilds it well. He interviews poorly reacting badly, taking personal offence any time a negative spin is inserted by journalists. There is a danger he will succumb to the “Marlyn Monroe” complex “Next” as his portfolio expands. He is no friend of his new leader and will find it difficult to buckle down and commit to policies with which he is uncomfotable. He liked being called a baby faced assasian by a twitterer. I think “Bopeep” is more apt. He is a Heart’s supporter which places him at odds with one half of Edinburgh. He is an avid Twitterer. Can’t be sure. It could be him!! The list links to my earlier comment. An old friend once advised myself that success would be assured in battle only if you took the time to get to know your enemy and his tactical nuances. Advice I heeded, to my advantage on many occasions. Mindful of the foregoing I dug around, extracted six months of his twitters and grouped them for analysis. I have posted theoutcome below, largely without comment as I answered many of his utterings at an earlier date. Enjoyment is guaranteed by reading his twittering then flicking to my responses. https://caltonjock.com/2015/04/28/ian-blinky-murray-labour-party-mp-for-edinburgh-south-shadow-scottish-secretary-a-comic-appointment-but-the-jokes-on-him You might well be able to add a few of your own. 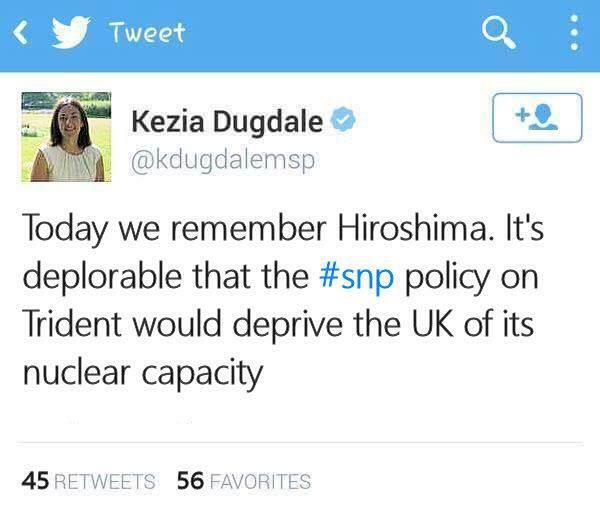 Kezia Dugdale MSP reminding people that SNP voted against putting living wage in govt contracts. They also redirected £1bn from poverty projects. UKTogether Brian Wilson 1967 bang on. SNP voted against Living Wage last week. They have powers but refuse to use them to help inequality. Small Biz Bill considering public procurement & impact on biz. Raised issue of Scot Gov voting against incl Living Wage in govt contracts. Salmond talks of social justice but has absolutely no redistributive policy. In fact his only economic policy is 3p tax cut 4 big biz. Cant fathom why SNP voted to exclude the Living Wage from SP procurement Bill today. Public contracts must lead by example 4 better pay. SNP manifestos in 07 & 11 promised 600 hours of childcare to all 3 & 4 year olds & haven’t delivered it. They could deliver it tomorrow. We continue on the doors as protests at BBC, talk of “days of reckoning” & anyone who disagrees with Salmond shot down. That’s worrying. Social injustice not resolved by nationalism. Political proposition that risk Edinburgh & Scotland losing RBS, Lloyds & Standard Life is economic vandalism that costs jobs. Hello everyone at ide bate, apparently me standing up for my constituents jobs means I’m not in Team Scotland. A sad day for Scottish politics. Gordon Brown “1m jobs in Scotland are dependent on being part of the UK”. This is the most positive case for UK. Strong single market. Gordon Brown “Labour took 2m pensioners out of poverty with pension credit so don’t let nationalists tell you otherwise. Gordon Brown has asked Speaker to allow time for debate immediately after referendum to get timetable for implementing more devolution. Trade Union GMBScotOrg has also launched their cost of indy calculator. GMB are campaigning for a NO vote in the indyref for jobs, pensions and solidarity GMB vote. Currency union would mean a foreign govt would set our budget & control our economy. which is why UK not in €. On the basis of Yes argument on EU and £ next time you get a parking ticket forget about the law and legal advice as pragmatism will kick in. I don’t get the German re-unification argument on EU as that was a country coming together as a member not leaving an existing EU member. How does a 3p corporation tax cut fit with greater fairness in Scotland? UK is not in € because UK doesn’t want EU currency union. Why would a £ currency union be any different? Arguments against € r same as £. I have a solution. If u want £, want EU, want a single market, want free movement & want mortgages to stay same u vote no. It’s called UK. Salmond said “the £ is a millstone around Scotland’s neck” and wanted Euro, now he wants £ with 3 plan Bs. Total economic vandalism. Sturgeon talks about a Wendy Alexander speech when she tried to predict oil price. Wendy got it wrong. Shows u can’t predict volatile price. I remember when First Minister said Pound was a “millstone around Scotland’s neck” when he wanted the Euro. All over the place on currency. After another 90 minutes debate there was still no answers to the key real issues of currency or economy. That’s too important to ignore. North Sea oil is not a bonus but supports current expenditure. It’s 50% of projected revenues. Independent Institute for Fiscal Studies estimated a £6bn black hole in Scottish finances. That’s a very large amount of money. Oil revenues fell by £5bn last year. The entirety of education budget. How would that gap be closed? Currency is not to be laughed about Mr Salmond it underpins my constituents jobs, mortgages and livelihoods. Scottish Govt can help save Fergusons shipyard now as with Prestwick Airport under devolution. The “Panama Plan” – using a currency without a central bank – is like driving a car without insurance. Everyone knows if you don’t pay your debts you get a bad credit rating and then it costs you more if you can get it. Salmond says he has 3 plan Bs but I’ve not heard 1 yet. Maybe I missed them. I think 1 option was a bus. The wonders of a democratic society. We got 18 years of Tory Govt in 1979 due to the SNP helping bring down the Labour Govt. Salmond claims on £ can’t even persuade his own side as Yes Scotland Chair wants separate currency or Euro!! Dennis Canavan I don’t think you could describe me as new labour but keep putting the old tags on people if you like. The Smith Commission is asking for submissions from you. Make sure you send them by 31/10 http://t.co/ZCwW0DpcEA for all the info. The world of work is critical agenda. Let’s talk about real issues rather than indy for a change. We have a First Minister that refuses to deal in established facts and rather prefers the maybe instead. Simply not good enough. The reintroduction of the 10p and 50p tax rates are pillars of fairness when people are struggling. SNP refuse to back this fairness. Chair of manufacturing body, EEF says the future of manufacturing requires the UK to stay together. He’s obviously a bully! Businesses have been advised to include the risk in their reporting analysis. That’s why they’ve spoken out. 1,000s of my constituents work in Standard Life & RBS. Not good enough 4 SNP 2 dismiss them. SNP MSPs represent their constituents, no? Don’t forget they (the SNP) campaigned 4 Indy throughout Labour in office. They also brought in 18yrs of Tory rule in ’79. And can Scottish taxpayers not pay for the new white paper please. £800k better spent on people & services. The SNP’s reasons 4 rejecting the Euro must surely be the same reasons for why £ currency union wouldn’t work? Identical issues. Pete Wishart complains there is not enough time for currency debate but hasn’t even put in to speak. Head of BP expresses concerns about indy & £. 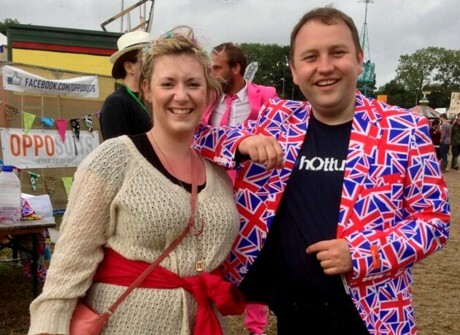 He’s slated as “British Nationalist” by Yes. BP invests £10bn a yr in Scotland. Shameful. The EU is mentioned 719 times in the indyref white paper but we don’t know if we will be in EU or how long it will take. Lots riding on it. The childcare policy in Indy White Paper can be delivered NOW as it is devolved to the Scottish Parliament. More smoke and mirrors. EU, debt, pensions etc. All these big assumptions will have to come off to keep things the same! The social justice mask slips from SNP as indy ref approaches bedroom tax Not 1 redistributive policy from SNP in 7 yrs in power, not 1 in white paper & now too busy with indyref to turn up to bedroom tax vote. Apologies for cancelling Friday constituency diary commitments but we defeated the Govt on the bedroom tax. Pete Wishart childishly ticking off names of scottish labour members voting against bedroom tax when he didn’t even appear to attend debate. Pete Wishart you know that’s not the way it works. Why don’t you lobby your boss to do something about it rather than peddling nonsense. SNP r desperate as they can’t defend doing zero on bedroom tax. Labour MPs did NOT abstain. MPs get paired off for absence. SNP know this. Minutes since I posted my blog piece and wings over scotland still not confirming retraction. He was quick enough to write it. Wings over Scotland your entire story is about vandalism to the doors of my office. That is not what happened. Retract it as its not true. I have therefore produced a response & people can make their own mind up about accuracy of Wings over Scotland blog. The bile on my feed says it all He has chosen not to do so but merely to say he will correct any errors “of which there are none”. According to Wings over Scotland I took time out of my busy diary to give Wings over Scotland a courtesy return call in order for him to retract his false blog last night. My constituency office was vandalised by Yes supporters last night. I can take personal abuse but it’s getting out of control. It would appear this guy is seemingly busy.Reminds me of an old Crosby song from one of his films.Busy doing nothing working the whole day through ,trying to find lots of things not to do.